Pain is something which is experienced by all and can be very uncomfortable. The International Association for the Study of pain define pain as " An unpleasant sensory and emotional experience association with actual or potential tissue damage, or described in terms of such damage". 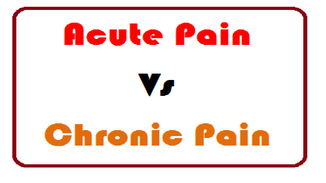 Pain is also based on an individual experience and can be categorized as acute and chronic pain. Acute pain usually has a duration of 12 weeks. It usually has a sudden onset from a known cause. It is an adaptive mechanism of the body to promote healing and recovery. Chronic pain occurs after 12 weeks. It is a long lasting pain and may arise from a particular injury that did not heal or an underlying cause. However there may not be an underlying cause. Pain can also present as Hyperalgesia (exaggerated response to noxious stimulus), or Alloydina ( pain generated from a normal stimulates that doesn't usually cause pain such as clothes rubbing on skin). A noxious event has been recognized as pain by a conscious person. The pain signals are carried thorough different afferent nerve fibers to the central nervous system. The slow unmyelinated C fibers transmit a broad range of stimulus such as mechanical, thermal, or metabolic. The fast myelinated A-fibers respond to mechanical or thermal stimulus by producing a sharp sense of pain. Once afferent nerve fibers are stimulated, an action potential is created to transmit pain signals to the dorsal horn of the spinal cord. Here a further synapse occurs and transmits to the thalamus and brain stem. Is a normal response of the nerves being stimulated by injury or damage such as sprain, burns, inflammation etc. The nerves transmit pain to the brain via the peripheral nervous system. The pain is usually localized and is like a constant dull ache. It is usually time limited as pain ceases when the damaged tissue heals. Typically seen in acute pain. Is result of injury or malfunction of the peripheral or central nervous system. It can be triggered by injury, but may not be due to damage to the nervous system. The pain usually presents as a burning or electric shock type of feeling. It can also cause sensory abnormalities. This type of pain is commonly seen in chronic pain, as pain signals are constantly firing. Examples of this are diabetic neuropathy, entrapment neuropathy (i.e carpal tunnel syndrome), peripheral nervous system (widespread nerve damage). Mediators within the body are released at the area of tissue inflammation causing the activation of the nocicpetive pain pathway. 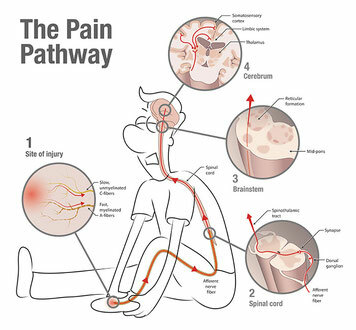 Therefore taking precautions to reduce the inflammation will effect the pain sensation level. Examples of this are appendicitis, Rheumatoid Arthritis, inflammatory bowel disease etc. However in many cases there can be a complex mixture of nocicpetive and neuropathic factors such as migraine pain, myofascial pain etc. Taking a full history, including physical and neurological screening. If the clinician feels necessary, referral for further imaging such as xrays, MRI, blood tests etc. Psychosocial assessment to assess any psychological factors contributing to pain management. Patient explanation of findings, diagnosis, treatment options and prognosis. Advice on activity, lifestyle, rehabilitation, self-management etc. Monitoring and re-assessing when required. Being in pain can be disabling and prevent daily activities. PRICE (protection, rest, ice, compress and elevate). Find your pain free movements and try to avoid any painful movements. NSAIDS, over counter pain killers (always read label). 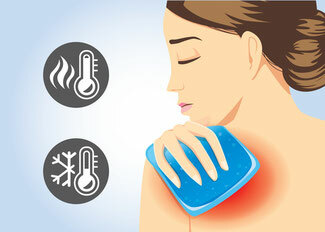 Heat is generally more effective for Chronic pain. Relaxation techniques using deep breathing. The above listed are not conclusive to the type of pain, and you may find that you do not fit into a particular area. Therefore it is important to seek professional health if you are experiencing pain.